11/22/63. 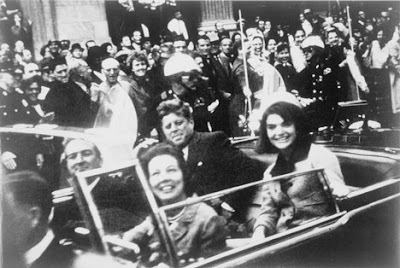 The day JFK was assassinated. A nation was devastated, stunned that a President was taken. Could it have been stopped? What if you could change history? Let's get this out of the way. I loved this book. LOVED IT. There are 849 pages to this sucker, and not one page is a drag. (Look at me, I'm using lingo not quite current anymore, and it's all because I got sucked into this story and felt like I lived Jake Epping's time travel adventure in the late '50s, early '60s). This is a brilliant piece of work, and if I end up making a "Top 10 Books I've Read in 2011" list, this is going smack dab in the number 1 slot. (It's two days away from the last month of the year, so I feel pretty confident about my odds. I could be wrong, but...I don't really think so). I've recently started reading Stephen King's work. I've been choosy, selecting ones considered King classics, so when 11/22/63 was being touted as the next best thing, I was hesitant. Selfishly, I wanted to wait until others read it. But then I got a Klout perk, downloaded it to my iPad, and was snagged from the first page into this time travel adventure and read it just under a week. For me, that's insane. Jake Epping, a small town New England teacher who recently went through a divorce from a struggling alcoholic, is introduced to this time warp by a good friend who invites him to help change history. In some freak of who-knows-what, there's some sort of wonky rabbit hole in his friend's diner that transports him from 2011 to 1958. The crazy thing is it always brings Jake to September 9, 1958, no earlier or later. Same time every time, and even crazier is that no matter how long Jake stays "in the past," when he returns to 2011, he's only missed two minutes. That's it. Whether he spends a day, a week, or even a few years, whenever he returns, it is only two minutes later "in the present." So what's a time-traveling good guy to do? 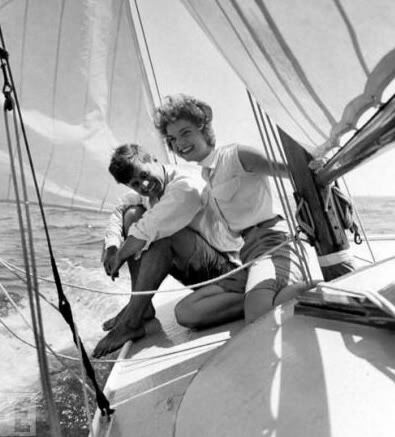 The closest major event to 1958 is the 1963 assassination of John F. Kennedy, which spiraled a flurry of events including Robert Kennedy's assassination, Martin Luther King, the Vietnam conflict. Some events could be associated with JFK's death, some maybe not...but it's up to Jake to take his friend's place and live five years in the past and, hopefully, save a President. While living "in the past," he meets a multitude of memorable characters (both good and downright troubling), obsessively stalks Lee Harvey Oswald, becomes attached to a community that makes him feel at home, and falls in love with the incredible and amazing Sadie. Let's also address this: It is not a horror story. It is all time travel. What I really enjoyed is that King doesn't waste time trying to explain the science or logistics of why there's a rabbit hole, and why it only deposits you on the same day and time in 1958, or even why only two minutes have passed when returning to the "present." It just is what it is, and that works just fine in this chunkster wallop of a story. I'm not the most experienced sci-fi reader, but I like to think I'm fairly logical. When a book presents me with some convoluted explanation on why something is happening scientifically, I tend to try to poke a hole in it. King, though, doesn't quibble over this, so as the reader I don't have to sit, wonder and worry if something really makes sense. It's as though I'm being told, "Look, the time/worm/rabbit-hole just drops you on September 9, 1958 every time. Why try to figure that out?" So I didn't worry about it. What is important to discuss is something often debated with time travel: If you change the past, even just slightly, will it have a positive or negative effect on the future? It's that "butterfly effect" which is evaluated in depth and it made me wonder what I would choose to do. I sure am glad I don't have to worry about that. Stephen King is a MASTER. In the short time I've gotten to know his work, it's refreshing. He leaves the pompous BS alone that some storytellers can succumb to within their fiction, and just tells a story humbly and genuinely, which is probably why his horror is so scary and why his non-horror is also loved. It isn't fake. And in this book, it is simply Jake's story and he tells it all in the first person and describes how he takes on another identity in a time when he hasn't even been born yet, how he has to acclimate to the culture shock of living in a world he knows, but doesn't really know, and simultaneously battles an unseen presence that does everything possible to make sure that the past is not changed. This is a multi-layered story of coincidences, along with Jake's struggles to stop awful events from happening to good people. All of this in the writing of another author might have gotten jumbled and lethargic. Instead, King deftly maneuvers through the story lines, successfully weaving in history and science-fiction, all the while taking you along for the ride so simple to understand that you're left dealing with the raw emotion of each event. The bottom line is there's a lot to tackle in this book, what with Lee Harvey Oswald, JFK, and the other events Jake tries to change along the way. And then there is also the other side of living, the human side of love, loss, and regret. It's beautiful and I will not lie, I choked up towards the end. When that last page comes, I felt like I was punched in the gut that it was all over. I hated leaving these characters. Do you remember when you were younger and when you read a book you loved, you hated that the story ended not because it was a good book that was now over, but because you had to suddenly face the reality that the characters you fell in love with really didn't exist? I don't know about you, but I experienced that when I was a kid, and I felt that tonight when I finished the book. I loved Jake, Sadie, Deke...every single one of the good guys. I miss them already. "Goose walked over my grave, I guess." (Sorta like getting goosebumps). 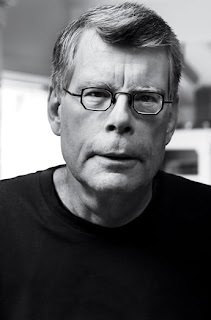 That I'm a new fan of Stephen King so when he brings back a character from a prior book, I don't realize it at all. I instead just like the character and then I find out from friends that so-and-so is from such-and-such, and man, did they love them. It bums me out that I couldn't experience fan-girl joy when a character returns. It's probably a lesson I should read King's work in the order of when it was published. guess that means i've got to go back on my word of giving up all stephen king...but if you say it is THAT good then I must believe. Fantastic review btw and that picture on the yacht is such a classic! Fab review. I've always shied away from King's books because I'm not a horror fan but this one has me intrigued. Thanks for the review. My book club will be voting on books at our next meeting and this is one of the books that's been proposed. It sounds like it would be a good pick! Awesome. I'm really looking forward to starting this one this week! I used to be such a fan of his and then kind of lost the thread. He's been on my radar again recently having just read On Writing, which I loved. You're right, he's a no-B.S. storyteller and I have to get back to reading him again. I'm a Stephen King fan, so I'm really looking forward to reading this book....especially since it's getting such wonderful reviews. I stopped reading him for awhile, but have been intrigued by this new book. So I'll probably get it and settle in for a long read. As far as I'm concerned, his very best ever was "The Stand." And don't read "IT" if you have a phobia about clowns. I've been scarred for life after reading that one! LOL. It's been a really long time since I've read King's work. I read his first three books in order of publication, and then in college I started jumping and skipping around -- mistake! I am most definitely interested in this book and even moreso after your review. I'm glad you loved it! I am not a fan of King (although I haven't given him a fair shake, to be honest) BUT I think I will love this book. The length scares me a bit! I haven't read any King yet, but since I LOVE time travel books, this is one that I need to get to soon. I am so glad to hear that you were enthralled with it, and I am hoping that I will be too! It sounds like a book that I am just going to love, and I will have to discuss it with you after I have read it! Fantastic review today, Natalie! I'm glad you loved it and looks like your #1 for the year. I went through a period right out of high school in the late 70s/early 80s where I read every Stephen King novel I could get my hands on ...Carrie, Salem's Lot, The Firestarter Cujo, The Dead Zone... until Pet Sematary ... I was on Stephen King overload and had enough. I just couldn't finish it. I did read The Stand in the 90s and was 'eh' about it. However, your review makes me want to dive right back in to Stephen King's world especially since it's a time travel! I think I may have to read this one. I do like alternative fiction when I've read it beforehand. I wish I had known about your Wolf Hall read-a-long(I've been away from my blog/blog list for a bit.) It's been on my to-read list for a while! Thanks for bringing your review to my attention! This sounds ah-mazing. I am definitely going to buy this one soon. So glad you enjoyed this one! Definitely gets me more excited to read it :) I haven't read many King books either, so I'm really looking forward to this one - will be kindling it soon! I am on hold for the audio (#4 I think) so I cannot wait. I have been reading King for ages. What makes him beloved is that he is ballsy and doesn't give a flip about explanations or overthink things. He just goes for it. I love it when he brings old characters into other books, and in Under the Dome, he mentioned Jack Reacher from one of my favorite mystery thriller series (King's favorite too). I almost had a cat. Total fan-girl stuff. I cannot wait to listen to this. I'm *almost* convinced to go for it. I'm fascinated by the premise, but scared by the length. I'm glad you loved it! I'm so happy you enjoyed it and I KNOW I will too. I am a big King fan and am always sad when people won't give him a try. He really is a master storyteller and so much more than what most people think! My boyfriend has been a King fan and I have always been afraid of them because they are so long, but this one has come on my radar and I think I will have to check it out! Thanks for the review! I'm with Ana, I think you convinced me to read this. And also, have you read The Stand yet? It's my all time favorite. Ha, sorry about that deleted bit. I am too quick to hit "post comment". You've convinced me. I've got to get my mitts on this one. Excellent review! And, yes, I do know that feeling -- wanting the characters to be real and wishing a story didn't have to end. It's very rare. I haven't read a single, solitary King book, but I'm actually tempted by this one. OK, so I will give Stephen King another try. I never returned after Cujo, but you have convinced me that the dog doesn't die and it's not scary.